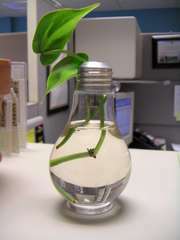 We've seen the repurposed lightbulbs as terrariums but here is another set of gems at www.instructables.com. While I love the terrariums I think the little bulb bud vases are really beautiful in a minimalist fashion. The one with it's own stand is adorable. I've always wondered if this is a good idea considering the mercury in light bulbs. I was just freaking out about handling a projector light bulb at work as the replacement bulb box was plastered with mercury warnings. I never though about this in relation to the lightbulb terrariums... good point redhead. wow, thats even better than turning old school computer CRTs into aquariums!